Add and element of fun to telling time! 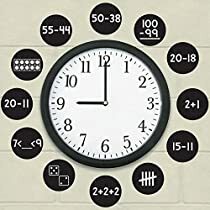 Affix these repositionable decals directly over the numbers on your classroom clock and challenge students to complete the math to figure out what time it is. Includes blanks to create your own problems.